Coordinate Harmony is 15”w x 9” deep x 40” tall. Weight – 450 lbs approx. Coordinate Harmony with pedestal is 18" x 18" x 64"t Weight 1300 lbs. approx. From http://abaddyon.com : "... Coordinate Harmony is a series of harmonies that operate independently of each other..... Renaissance musicians often used this type of harmony, and it’s capable of producing rich and moving textures within a piece of music." 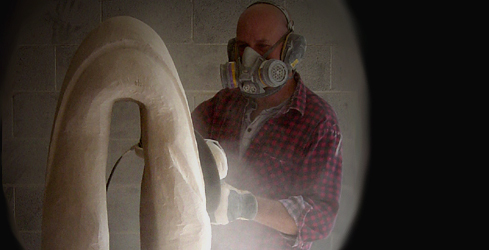 Coordinate Harmony's front flows sinuously upward in tune with the back of the sculpture making music joyfully. The front & the back are in harmony, musically, with each other but articulating slightly different parts of the composition. They are different but similar bringing a richness to the whole composition.